Coach Eric Hoxie’s Arabia Mountain Rams remained in the thick of the hunt for another regular season Region 5-AAAAA crown, rolling past Miller Grove (13-3) March 25 and Miller Grove (16-4) again March 27 in moving to 7-1 in the league and 9-3 overall. Junior Desmore Joseph (2-3; 2 RS; 1 2B) and senior Micah Sanders (2-3; 2 RBI; 1 RS) paced the Arabia Mountain offense in a 13-3 triumph over Miller Grove March 25. Freshman Devin Tavington earned the mound victory for the Rams, striking out five and walking two over three scoreless innings. Arabia Mountain came back to defeat Miller Grove again by a 16-4 margin March 27, as junior Aric Porter (3-3; 2 RS; 2 SB) and senior Zion Lockheart (3-4; 2 RBI; 2 SB) shined brightest in an 18-hit attack. Lockheart also registered the pitching decision, striking out eight and walking three over five innings. 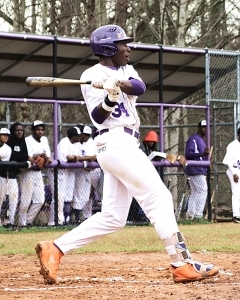 Junior Jalen Buckner had a strong week at the plate for Miller Grove in a pair of losses to Arabia Mountain. Buckner posted a 1-3 outing with one RBI, one double and one stolen base in a 13-3 defeat March 25 and then finished 1-3 with two RBI, one double and one stolen base in a 13-4 loss March 27. Coach Samuel Marion’s Lithonia Bulldogs continued to rise to the top of the Region 5-AAAAA standings as well, sweeping Columbia twice by the scores of 7-4 March 26 and 15-2 March 27 in moving to 5-1 in the league and 8-5 overall. Lithonia slipped past Columbia (7-4) March 26, with sophomore Marcellous Allen striking out 12 and allowing only four hits, one walk and one earned run over five innings to secure the mound decision. Freshman Amir Streeter (3-3; 1 RS; 2 SB) and sophomores Bryson Suber (2-2; 2 RS; 3 SB; 1 RBI) and Narvin Booker (2-2; 3 RS; 1 RBI; 3 SB) collected multiple hits in the outing. Coach Timothy Jones and the Stephenson Jaguars are fighting for a Region 4-AAAAAA crown and improved their chances by besting Morrow (5-1) March 27 and Morrow (11-3) again March 29 to move to 7-2 in the league and 12-2 overall. Junior Shane Daley turned in a strong offensive outing for Stephenson in an 11-3 victory over Morrow March 27. Daley went 2-2 with four RBI to pace the Jaguars. Coach Matt Masce’s Tucker Tigers rounded out the group of local squads with 2-0 records from last week, slipping past Lovejoy twice by the scores of 4-3 March 27 and 7-6 March 29 to improve to 9-1-1 in Region 4-AAAAAA and 10-3-1 overall. The 9-1-1 mark is good enough for first place in the league. Senior Max Stephens tossed a one-hitter for Chamblee in an 11-0 blanking of Clarkston March 25. Stephens struck out six and allowed only one hit in three scoreless innings. Seniors Davis Jenkins (2-2; 3 RBI; 1 SB) and John Principe (2-2; 2 RS; 1 RBI) collected multiple hits in the contest. Senior Travis Hammond (2 IP; 4 SO; WP) and sophomore Finn Allers (3 IP; 4 SO; 3 B; 1 HA; 1 R; 1 ER) teamed up to hold the Angoras to one hit again in Chamblee’s 11-1 victory March 27. Senior Anthony Terrell went 1-2 with a double and one RBI in Clarkston’s 11-1 loss to Chamblee March 27. Sophomore Brian Morris turned in five solid innings in defeat on the mound for the Angoras in the contest, striking out two and allowing five earned runs, seven hits and two walks. Sophomore Joseph Garcia shined in defeat as Lakeside dropped a 5-0 decision to Brookwood March 25. Garcia went the full six innings on the mound, striking out one, walking two and allowing only eight hits and two earned runs. Junior Deatric Alexander finished 2-3 with one run scored for Lakeside in an 11-1 loss to Collins Hill March 28.